A rare production of the landmark "Einstein on the Beach" comes to Ann Arbor next weekend. A remounting of composer Philip Glass and director Robert Wilson’s groundbreaking and rarely performed “Einstein on the Beach: An Opera in Four Acts”—which will be performed in Ann Arbor, courtesy of the University Musical Society—has been a topic of serious (and hopeful) discussion for 10 years. But as recently as a few years ago, when incoming New York City Opera artistic director Gerard Mortier resigned (because the poor economy resulted in him having a fraction of the season budget he’d originally been promised), UMS production/programming director Michael Kondziolka thought the “Einstein” revival wouldn’t happen. I vividly remember happening to be at the Metropolitan Opera in November 2008. 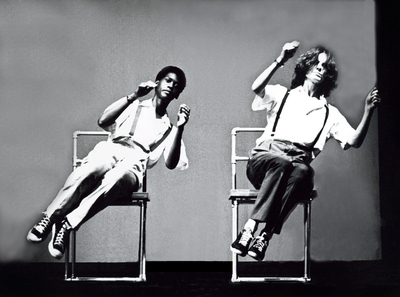 One of the primary pieces of the “Einstein” puzzle involved UMS’ proposal to have everyone involved in the new production—including Glass, Wilson, and choreographer Lucinda Childs, all of whom are now in their 70s—come to Ann Arbor for an intensive, three-week-long rehearsal period, while UMS took care of the expenses. One benefit of this is that the artists will be able to engage with the university and the community more significantly while they’re in the area; but it also means the artists will be supported as they work to stage a show that’s only been mounted three times (‘76, ’84 and ’92), and that, outside of New York City, hasn’t before been seen in North America. The question arises because the five-hour, intermissionless work—which invites audience members to wander in and out at liberty—doesn’t tell a linear narrative, but rather uses a series of recurrent images in juxtaposition with abstract dance sequences; and Glass composed “Einstein” for sythesizers, woodwinds, and the voices of the Philip Glass Ensemble, collaborating closely with Wilson as the piece originally came together. What: Rarely performed, revolutionary opera by composer Philip Glass, and director Robert Wilson, that uses a series of powerful recurrent images in juxtaposition with abstract dance sequences created by American choreographer Lucinda Childs. When: Friday and Saturday, Jan. 20-21, at 7 p.m., and Sunday, Jan. 22 at 2 p.m.
How much: $18-$60. 734-764-2538 or www.ums.org. Related event: Philip Glass and Robert Wilson will appear at the Michigan Theater, 603 E. Liberty St., at 4 p.m. Sunday, Jan. 15, as part of the Penny Stamps Lecture Series. Admission is free. “Einstein” also, according to Kondziolka, put a spotlight on avant-garde artists who were working in New York City. The Ann Arbor performances of “Einstein” will kick off the show’s international tour; and due to minor structural constraint, they are officially considered previews—a compromise that arose from yet another kink during the planning stage. “(There’s a stage image) that will still be part of the piece in Ann Arbor, but it can’t be realized in exactly the way they want it to be,” said Kondziolka. The glitch led to a discussion as to whether “Einstein” should ultimately be teched in Ann Arbor or in France, but in the end, Kondziolka and UMS won out. What had Kondziolka’s strategy been? “I pulled on the old heartstrings,” he said.